Make the Most of Your Time in Philadelphia - America's Birthplace and Most Historic City! Independence Hall in Philadelphia's Historic District. The final version of the Declaration of Independence was adopted by the Continental Congress at Independence Hall, the birthplace of the United States of America, on July 4, 1776. 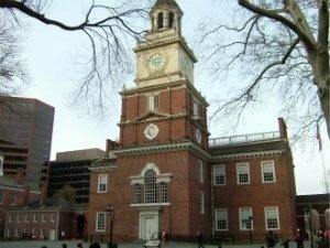 Eleven years later, Independence Hall would also witness the creation of the U.S. Constitution, on September 17, 1787. We hope to make it a unique resource, for anyone traveling, studying, or living in the city or region. If you're looking for something in particular, you can use the Google Custom Search box below, to search all of the constantly growing pages, of Enjoying Philadelphia - there are currently 265 pages and counting. The colony of Pennsylvania - then consisting of only three counties - was founded by William Penn in 1682 - that is, nearly a century, before the thirteen American colonies declared their independence from Great Britain. In 1776, the Declaration of Independence was vigorously debated and signed here. Eleven years later, in 1787, the U.S. Constitution was debated with equal vigor, and written here. You can visit the Pennsylvania State House - now known as Independence Hall - where both documents were adopted. Of course, just across the street, you can also see the Liberty Bell, perhaps the most lasting symbol of the nation's freedoms. However, the city and region have a great deal more to offer than their boundless, authentic history. They have world-class museums and cultural institutions, countless restaurants and nightclubs, and a full, year-round calendar of sporting events - to name just a few. There are so many things to do in the city and region, that even a lifelong native of the area, could never hope to directly experience all of them. And for that reason, the challenge is even more daunting, for a visitor who is here for a day, or a week. The mission of Enjoying Philadelphia is to help you - the visitor, student, or resident - enjoy the city and region to the utmost. Accordingly, throughout site construction, we'll be seeking to assemble the ultimate guide to various attractions and offerings. And hopefully, each time you visit, you'll find something else new and exciting to do, in the City of Brotherly Love. This is the Visitor Site Map, for our site. We continue to constantly add content on Philadelphia tourist attractions, hotels, etc. This page will help you find what you’re looking for, quickly. About Us - why we’ve decided to create Enjoying Philadelphia, for both visitors and locals, with travel information, tourist attractions, and more. Contact Us For More Information on Enjoying Philadelphia! If you’d like to learn more about enjoying Philadelphia, just fill out this short form. You can ask questions about visiting the city, or sign up for e-mail updates. For Advertisers – Become a Sponsor of Enjoying Philadelphia! For advertisers – become a sponsor of our site! We attract affluent visitors and locals, for upscale hotels, restaurants, and tourist attractions. January 2012 Philadelphia Events start with the Mummers Parade on New Year’s Day, the smash hit Jersey Boys at the Forrest Theatre, and much more! December 2010 things to do in Philadelphia – at Macy’s, the beloved Light Show, and entering the life-sized version of A Christmas Carol at Dickens Village. The Comcast Holiday Spectacular in HD is very convenient to SEPTA trains, Macy’s Holiday Light Show and Dickens Village, as well as Christmas Village. Macy’s Philadelphia – in the former John Wanamakers on Market Street – is home to the Holiday Light Show and Dickens Village, starting Black Friday. November 2011 Philadelphia Events – Veterans Day, Thanksgiving Eve parties, Black Friday, and much more than just turkey. The Jimmy Rollins Foundation Havana Nights charity event at the Constitution Center featured many Phillies and other A-list local celebrities. October 2011 Philadelphia events – Phillies playoff games, Terror Behind the Walls, Rembrandt at the Art Museum, Mummies at the Franklin Institute. Halloween 2011 Philadelphia events – Mummies at the Franklin Institute, Terror Behind the Walls, Boo at the Zoo, Pumpkinfest, and Dracula Festival. Philadelphia Halloween Parties 2011 are abundant – find the best places for adults to celebrate with costume contests, nightlife, and other revelry. September 2011 Philadelphia events - Rembrandt at the Art Museum, Mummies at the Franklin Institute, and Constitution Day at the Constitution Center. The Shane Victorino Nicetown Boys & Girls Club Grand Opening was due to the generosity of the Phillies All-Star centerfielder, the “Flyin’ Hawaiian”. The 3rd Annual Shane Victorino Foundation All-Star Celebrity Fashion Show recap from the prestigious Union League, with many Phillies and their wives. Temple suffers heartbreaking loss to Penn State, 14-10, after leading nearly the entire game – it sought its first win over the Lions, since 1941. May 2011 Philadelphia Events include the Dad Vail Regatta on the Schuylkill River, Mother’s Day, Leonardo at the Franklin Institute, and Memorial Day. June 2011 Philadelphia Events include Philly Beer Week, cyclists challenging the famous Manayunk Wall, and the start of the Welcome America Festival. July 2011 Philadelphia events include the Welcome America Festival, fireworks, concerts, patriotic parades to celebrate July 4, and American independence. August 2011 Philadelphia events include the George Washington exhibit at the Constitution Center, and Old City outdoor bars, nightlife, and vibrancy. Welcome America 2011 Events begin June 24 and end July 4, Independence Day, with fireworks, parades and patriotism, in America's most historic city. January 2011 Things to Do in Philadelphia – the Mummers Parade on New Year’s Day is a hallowed tradition, with hotel packages for visitors. Read more. March 2011 Philadelphia Events include the Philadelphia Flower Show, St. Patrick’s Day celebrations, NCAA tournament March Madness specials at bars. February 2011 Philadelphia Events range from Valentine’s Day dates, romance, and activities, to Presidents’ Day celebrations to Super Bowl parties. Valentine’s Day 2011 Philadelphia Events - the best ideas for dates and romance, restaurants and parties, for couples - and singles, still looking. Christmas Village in Philadelphia is located at City Hall, adjacent to Macy’s Holiday Light Show and Dickens Village – which is great for visitors. The Macy’s Holiday Light Show – at the old John Wanamakers store – has been a beloved Philadelphia Christmas tradition since 1956, for visitors. The Macy’s Dickens Village offers visitors the chance to walk through a life-sized version of A Christmas Carol, a unique experience, since 1984. Philadelphia New Year’s Eve Parties 2010 – a complete guide for upscale parties and events, fireworks, nightlife, and revelry, to celebrate 2011. Philadelphia New Year’s Eve 2010 Events – a complete guide for celebrating the arrival of 2011 – Penn’s Landing fireworks, parties, and things to do. A Christmas Carol Philadelphia Guide – the artistry of the Macy’s Dickens Village, a life-sized version of 1840s London that you can walk through. The 2011 Mummers Parade on Broad Street continues a uniquely Philadelphia tradition – and an entertaining New Year’s Day celebration for visitors. The 2010 Army Navy Game – the 111th in the series – will take place on December 11. This is a travel guide, describing things to do in Philadelphia. November 2010 Things To Do In Philadelphia – Thanksgiving, Etc. There are many November 2010 things to do in Philadelphia, as the leaves continue to fall. You can see many attractions over Thanksgiving weekend. A Philadelphia Thanksgiving means the Thanksgiving Day parade, but high school football, Black Friday shopping, and dining in fine restaurants. Philadelphia Thanksgiving Eve 2010 – Wednesday, November 24, 2010 - will be rollicking, with revelry, parties, events, nightlife, and things to do. Philadelphia Thanksgiving 2010 things to do – the Thanksgiving Day parade, Black Friday shopping, and the Macy’s Light Show and Dickens Village. Philadelphia Black Friday 2010 Events and things to do on November 26 include the Macy’s Holiday Light Show and Dickens Village, as well as shopping. October 2010 Things to Do In Philadelphia – Ghost Tours, Etc. October 2010 things to do in Philadelphia – ghost tours, tours of the Gothic fortress of Eastern State Penitentiary, and the Cleopatra exhibit at the Franklin Institute. Read more. Philadelphia Halloween Parties 2010 for adults, take place on Friday, Saturday, and Sunday, with vibrant nightlife and costume contests. Read more. April 2011 Philadelphia Events include the first Philadelphia International Festival of the Arts –PIFA - with light shows on the Avenue of the Arts. Independence Visitor Center, in Old City, should be your first stop if you are visiting the city, for information on Philadelphia tourist attractions. Getting around Philadelphia - there are many ways, but which is right for you, to see the most attractions and places to visit in Philadelphia? Read more. SEPTA is the Philadelphia mass transit system. This guide is designed for visitors, explaining Regional Rail travel, the Blue Line, the Broad Street Subway, fares, tokens, and all the rest. Read more. Learn how best to use SEPTA, while visiting downtown Philadelphia and beyond. The Phlash - Much better than SEPTA, for getting you around downtown Philadelphia. Find everything about SEPTA Regional Rail train travel, in and around Philadelphia and its suburbs- whether you are a visitor, or a resident who is taking the train for the first time in a while. Independence Hall is a must-see when traveling to Philadelphia- learn how to get the most out of your visit! The Liberty Bell is the best known symbol of Philadelphia – and it has a brand-new pavilion for visitors. Read some tips about touring its new home, and making the most of your trip. The Betsy Ross House - Is the Legend True? Was the Betsy Ross House really the birthplace of the U.S. flag? Elfreth's Alley is the oldest continuously inhabited street, that is, in Old City Philadelphia. Eastern State Penitentiary is the eeriest of the Philadelphia attractions. The prison resembles a fortress in enemy territory, awing the visitor - and that design was not by accident. Eastern State Penitentiary is off the beaten path for travelers to Philadelphia– read the best ways to get there via SEPTA, the Phlash, car, and by foot. Philadelphia Restaurants - Which Ones Are Best For You? Philadelphia restaurants, among the finest in America, offer a superb variety of cuisine and options, making Philadelphia nightlife uniquely enjoyable. Philadelphia Craft Beer – Where Should You Go For the Finest? The Philadelphia Craft Beer scene has all sorts of ales and lagers, with so many microbreweries and bars and restaurants, offering the rarest and most exotic brews. But which places should you visit? Philadelphia hotels are plentiful in Center City, for every location, taste, and budget, and near all of the popular places to visit in Philadelphia. But which one is right for you? Read more. Looking down from William Penn's hat- experience the best aerial view of the city by a visit to Philadelphia City Hall Tower, from atop the gigantic statue of the founder. Penn's Landing is the riverfront entertainment district of Philadelphia, with many worthwhile places to visit on both sides of the Delaware River, with frequent ferry crossings to the New Jersey side. The Philadelphia Mint, the oldest in America, has existed since 1792. It has the capacity to strike 32 million coins a day – but it’s a free place to visit. Read more. A guide to enjoying the many Philadelphia Museums, such as the Museum of Art, The Franklin, The Academy of Natural Sciences, the Independence Seaport Museum, as well as many others. The National Constitution Center is an outstanding attraction in Philadelphia - get the most out of it! The Academy of Natural Sciences, in Philadelphia, is the oldest institution devoted to natural sciences, in the entire Western Hemisphere – it is nearly two centuries old. Read more. The Philadelphia Museum of Art Offers World-Class Art Collections and Exhibits - Not Just the Rocky Steps and Statue. If You Have Time, Go Inside, Also. Lights of Liberty is well worth its price- a dazzling, after-dark, cutting-edge multimedia experience, which places the visitor in the midst of the thrilling events of 1776 - Read how. Philadelphia tours - find the best one for your visit to the city. Get the most out of your one day visit to Philadelphia – tour the most memorable historic attractions in Old City – the Liberty Bell, Independence Hall, Franklin Court, among others. Read how. Looking for a two day tour of Philadelphia? Try this customized tour, with one day on the Ben Franklin Parkway, and the other in Old City. There are many free places to visit in Philadelphia, especially in Old City, such as the Liberty Bell and Independence Hall. And some less famous ones, which are equally cool to tour. Read more. Old City Philadelphia is the most historic square mile in America. Read why. Northern Liberties - a steadily gentrifying neighborhood – has superb choices for restaurants, nightclubs, and - especially - craft beers in Philadelphia. But which places are best for you to visit? South Street, the southernmost street in Center City, is among the coolest streets in Philadelphia, particularly on weekend nights. Its vibe has always been unique and distinctive. The Ben Franklin Parkway is home to many Philadelphia museums - get the most out of it. Rittenhouse Square in Philadelphia has a well-deserved reputation for sophistication. Read why. Fascinating Liberty Bell facts – read more about the unique Philadelphia landmark, that has inspired generations with a promise of freedom for all. Fairmount and the Art Museum Area – different names for the same Philadelphia neighborhood – offer arts and culture, hipness, and a variety of quality bars and restaurants to visit. Read more. Main Street in Manayunk has among the best foot traffic anywhere, if you’re looking for a dynamic, hopping place to visit in Philadelphia. But which bars and restaurants should you visit? Read more. Learn the best, easiest and most convenient ways to go to Old City Philadelphia attractions, after getting off SEPTA trains at Market East Station. Betsy Ross is one of America’s most popular historical figures. But did she really make the first American flag? For more FAQs, read more. Philadelphia Guidebook Reviews – Which Ones Should You Buy? There are many Philadelphia travel guides out there – but comparatively few Philadelphia guidebook reviews. Learn which ones are worth the money and space in your travel bag on your next trip here. This blog has detailed information on places to visit and things to do in Philadelphia - its museums, historic sites, nightlife and entertainment. A guide to the best downtown Philadelphia ice cream. The nation’s birthplace can be hot and humid in the summer, but these are great places to visit, year-round. The Broad Street Subway, also known as the Orange Line and the Broad Street Line, are different names for the same SEPTA transit line in Philadelphia. Read this guide for visitors. Taking SEPTA to Citizens Bank Park may seem confusing at first, especially if you’re not familiar with SEPTA. But you’ll find it far easier than driving and parking there. Read more. Traveling to Manayunk – a vibrant, hip neighborhood – is a great choice, when you are visiting Philadelphia. But with parking scarce, here’s how to get to the hopping nightlife scene on Main Street. The Manayunk craft beer scene is located in one of the most popular neighborhoods in Philadelphia. However, Manayunk can be confusing to new visitors, and this guide helps you find your way around. Historic Christ Church in Old City Philadelphia dates to 1695, while its Burial Ground dates to 1719 – Benjamin Franklin’s grave can be visited there. A Citizens Bank Park Guide, for those fortunate enough to obtain tickets to cheer on the Phillies in person. What to see, eat, and visit, while you’re there at the magnificent ballpark. Read more. Getting Phillies Tickets? Nearly impossible, nowadays, given the long string of consecutive sellouts. However, this guide will improve your chances of getting into Citizens Bank Park. Read more. SEPTA Regional Rail fares can be confusing at best, especially since SEPTA recently revised the rules. Learn more, on how to take the train to and from the major Philadelphia tourist attractions. Philadelphia Irish Pubs are among the city’s most popular bars and restaurants, especially given its high number of Irish-Americans. Whether you’re Irish or not, enjoy the wide range of choices. The Avenue of the Arts is Broad Street in Philadelphia, primarily south of City Hall. You can tour the historic Academy of Music, the Kimmel Center, and other fine and performing arts venues. Old City Philadelphia Hotels – you should stay in the heart of America’s most historic square mile. Plus, after dark, the area heats up with scintillating nightlife you won’t want to miss. Read more. Pennsylvania Convention Center hotels are the most abundant anywhere in Center City, for obvious reasons. But which one is the best for you– and for seeing Philadelphia tourist attractions? Read more. Rittenhouse Square Hotels are densely packed in a small area in downtown Philadelphia. They provide easy access to the many museums and performing arts venues in the area. Read more. Benjamin Franklin Parkway Hotels will put you within an easy walk of many Philadelphia tourist attractions – but there aren’t as many to choose from, as in the rest of Center City. Read more. Penn’s Landing Hotels offer an opportunity to stay near major Philadelphia tourist attractions like the Independence Seaport Museum, as well as the RiverLink Ferry to Camden Waterfront attractions. Philadelphia Bed and Breakfasts are small, compared to the huge, modern hotels around the Pennsylvania Convention Center. But if you’d like a distinctive, historic hotel for your visit - read more. Amtrak Philadelphia train service makes it easy to visit here, from anywhere in the Northeast Corridor. Learn how best to reach your hotel, restaurants, and tourist attractions, once you arrive. SEPTA tokens are often the most convenient, fastest, and cheapest way to travel on the Blue Line, the Broad Street Subway, buses, etc. But are they the best deal for you, on your visit? Read more. Three days in Philadelphia can be an extraordinary travel experience, providing you some time to see the museums and historic sites and take some tours. But how do you plan your visit? Read more. Philadelphia travel offers stunning museums, unmatched historic sites, and rollicking nightlife, in a tremendous, world-class city. Plan your visit here, to make the most of your visit. Read more. Driving to Citizens Bank Park brings a unique set of challenges. There are several ways of doing so, each with advantages and drawbacks: I-95, I-76, I-676, the Blue Route, Broad Street. Read more. Harry the K’s Restaurant is known formally as Harry the K’s Broadcast Bar and Grille. This an independent review of the experience, and how it can enhance your enjoyment of a Phillies game. Read more. Citizens Bank Park, the home of the Philadelphia Phillies, opened in 2004. Possibly the finest ballpark in North America, CBP offers a plethora of entertainments to any baseball fan. Read more. The Philadelphia City Hall Tower tour provides the opportunity for visitors to literally stand in the brim of William Penn’s hat, and look out over the city he founded over 300 years ago. Read more. The Villanova SEPTA options are tremendous, with train, trolley, and bus service all available, directly on campus. But what are the best, safest, and fastest ways to travel to the city? Read more. Philadelphia frequently hosts the Army Navy Game, and remains its traditional home. Find the best hotels and restaurants to try, as well as tips for getting to Lincoln Financial Field. Read more. Taking SEPTA to Lincoln Financial Field in South Philadelphia is often the best way to travel there, given the football stadium’s huge capacity. Here are some tips for taking the Broad Street Subway. Center City District has many convenient, easy-to-navigate, color-coded disks, maps, and directional signs posted, pointing the way to Philadelphia tourist attractions. Read more on how to use them. The Philadelphia Historic District is the home of the Liberty Bell, Independence Hall, the Betsy Ross House, and many other tourist attractions. Read more, on how best to walk around and explore it. The Rittenhouse Square District is centered around the square, and many top Philadelphia hotels and restaurants line it. Read more about how to explore the area during your visit to the city. The Convention Center District is based around the Pennsylvania Convention Center, and many of the top Philadelphia hotels are located, nearby. Read more about what to see there, when you visit. The Ben Franklin Parkway Museums District has some of the top Philadelphia museums- on a grand, wide boulevard, ending at the Art Museum steps that Rocky made famous. Which sights are best for you? The Washington Square District has some of the finest Philadelphia restaurants, right near the Avenue of the Arts attractions – and plenty of history, too. Read more, about exploring the area. The Chestnut Hill Philadelphia neighborhood was the first suburb in America, and today, its tree-shaded Germantown Avenue offers a pleasant mix of shops, restaurants, and places to visit. Read more. The Battle of Germantown – fought in 1777, during the Revolutionary War – is re-enacted with stunning accuracy, each October. See the 18th-century soldiers in action, at the Cliveden historic site. The Phillies schedule has 81 home games, annually. Since 2007, it has often included more October games than normal, due to their recent success. Find out when the games are, at Citizens Bank Park. Terror Behind the Walls, staged at the Gothic, historic Eastern State Penitentiary in Fairmount, is one of the most popular haunted houses in America. Find the schedule, tickets and dinner packages. October Things to Do In Philadelphia offer haunted happenings for every taste and age, from eerie Spirits of ’76 Ghost Tours in Old City, to Terror Behind the Walls at Eastern State Penitentiary. College Day on the Parkway – on one Saturday every September since 1987 – offers free admission to all Parkway Museums for college students with valid ID, along with free shuttle buses. Read more. Philadelphia Christmas 2010 things to do include the Macy’s Light Show and Dickens Village, Christmas Village, and many other events for visitors. Our West Side Story Academy of Music review, running on Philadelphia’s Avenue of the Arts, during the classic musical’s 2012 national revival tour. The Barnes Foundation is the largest private art collection in America, and the art museum will move to the Ben Franklin Parkway, at some point in 2011. Read more. Taking SEPTA to Eastern State Penitentiary can be tricky, especially if you are visiting Philadelphia and you aren’t familiar with the city. Learn the best ways of traveling there. This Battle of Germantown history describes Washington’s attempt to defeat the British at Cliveden, a historic estate, during the Revolutionary War in October 1777, and re-enacted annually. Philadelphia ghost tours offer visitors a unique experience of the eerie, in America’s most historic and haunted city. Which one is right for you? Laurel Hill Cemetery, located in Fairmount Park, is a tourist attraction that hosts many macabre events, including the Gravediggers Ball in October. The Chestnut Hill Fall For the Arts Festival – staged the second Sunday in October – regularly draws tens of thousands of visitors to Philadelphia. Taking SEPTA to Chestnut Hill is easy, as there are two Regional Rail Lines that travel there, and both are convenient for visitors. Which is best for you? SEPTA Independence Pass – for $11, it’s good for one day’s travel anywhere, including some Regional Rail trains. But is it the right deal for you? Bloktoberfest is an annual October event, in the increasingly hip and vibrant Graduate Hospital neighborhood, just south of Center City Philadelphia. Philadelphia Phillies History is replete with World Series titles and NL pennants – at different ballparks, for more than a century of baseball. Spirits of ’76 Ghost Tours is a 75-minute walking tour, of the most haunted sights in Old City Philadelphia – offered all year, but daily in October. This is a comprehensive Phillies Giants NLCS Preview, as these two ancient National League teams battle for the right to go to the 2010 World Series. Taking SEPTA to Wells Fargo Center events, at the one-time Wachovia Center, can be challenging – here are the fastest and safest ways to get there. The Manayunk train station – the best way to get to Main Street nightlife via SEPTA – can be very confusing for visitors traveling there. Learn more. Phillies World Series appearances have taken place in 2009, 2008, 1983, 1980, 1950, and 1915 – with two glorious championships in October. Read more. Philadelphia Halloween 2010 events, parties, and things to do for visitors, on the ghostly holiday this year, which falls on a weekend. Read more. City Food Tours Philadelphia provide a highly educational and entertaining guide to visitors, with many different tours, for every taste. Read more. Peddler’s Village, in Lahaska, Bucks County, is a short drive north of the city. It has many quaint shops, as well as seasonal events, and festivals. Headhouse Square is a lively part of the South Street scene, with many bars, restaurants, and nightlife, with an interesting history. Learn more. Liberty 360 is a short 3-D movie, begun in 2010, at Lights of Liberty in historic Philadelphia. It is a great tourist attraction, for families. The King of Prussia Mall, located near Valley Forge, is the largest mall in the Philadelphia region - one half is the Plaza, the other the Court. The Elfreth’s Alley Tour is highly worthwhile for visitors to Old City Philadelphia – a fascinating, guided tour to a museum of 18th-century life. Dates in Philadelphia – whether it’s the first, second, or fiftieth date, there are plenty of events and things to do in Philadelphia for romance. Philadelphia Restaurants Thanksgiving 2010 offerings include the traditional turkey, and visitors can find any style, ambience, cuisine, or price. Fort Mifflin, the fort that saved America in the Revolutionary War, has tours and events – Freedom Blast in July, Historic Siege in November, etc. Philadelphia Thanksgiving History – how Benjamin Franklin wanted the turkey – not the eagle - as the national bird, and the first Thanksgiving parade. 2010 Army Navy Game Hotels are convenient for visitors and fans in Center City, near Philadelphia tourist attractions, restaurants, and nightlife. Historic Skippack Village has over 50 quaint shops, cafes, and restaurants to walk around and enjoy, plus special events – it dates back to 1725. The Philadelphia Marathon both starts and ends at the Benjamin Franklin Parkway, in front of the Museum of Art’s famous Rocky Steps, appropriately. Philadelphia Premium Outlets are not located in, or close by, the city, but its many stores provide a great open-air mall experience for shoppers. King of Prussia Christmas 2010 Events - Santa’s Hours, Santa’s Fast Pass, Gift Wrapping, and on some days, a free Courtesy Shuttle around the Mall. Philadelphia Christmas 2010 Free Things to Do are plentiful – Macy’s Holiday Light Show, Dickens Village, Comcast Holiday Spectacular, and more. The Gallery at Market East is an underground shopping mall, connecting a SEPTA train station, and two SEPTA Blue Line stops – 11th and 8th Streets. The Philadelphia Thanksgiving Day Parade 2010 features colorful floats, performances, and other entertainment on the Benjamin Franklin Parkway. The Market and Shops at Comcast Center are new and upscale, attached to Suburban Station - and the fastest path to the Comcast Christmas Show. Philadelphia Christmas Date Ideas for romance, include the Macy’s Holiday Light Show and Dickens Village, the Comcast Holiday Spectacular, and more. Penn’s Landing RiverRink, sponsored by Blue Cross, is the only outdoor public ice rink in Philadelphia, and offers skate rental, lessons, and events. Philadelphia Christmas Shopping - Macy’s, Liberty Place, Etc. Philadelphia Christmas shopping – downtown, Macy’s and the Shops at Liberty Place; and the huge, suburban King of Prussia Mall, among other options. Longwood Gardens in Chester County is a bucolic paradise, with highly popular events and beautiful displays year-round, especially at Christmas. The American Society for Cell Biology 2010 Convention Travel Guide, so scientists can explore the city’s rich scientific history and attractions. 2010 Army Navy Game Tickets Guide provides seating information on which is the Army side, Navy side, and sources of tickets - StubHub, etc.. The John Wanamaker Store, dedicated in 1911, is now Macy’s, but still has the Crystal Tea Room, Grand Court, Organ, Eagle, and Christmas Light Show. The 2010 Army Navy Game Preview is a complete guide to the most storied rivalry in college football, between the Black Knights and Midshipmen. 2010 Army Navy Game Recap – The Navy Midshipmen defeated the Army Black Knights, 31-17, at Lincoln Financial Field - the 111st meeting of the schools. The Running of the Santas 2010 will be in Northern Liberties, from Finnigans Wake (the “South Pole”) to the Electric Factory (“the North Pole”). Macy’s A Christmas Carol / Dickens Village, is in the former Wanamakers at 13th and Market, and you can walk through a life-sized version of the tale. Philadelphia New Year’s Eve Fireworks 2010 – a guide to the two Penn’s Landing pyrotechnics shows, and the best times and places to watch from. SugarHouse Casino is located in Fishtown, an increasingly trendy neighborhood, located north of Center City – the first casino in the city. Read more. Yuletide at Winterthur Museum & Country Estate is an incredibly lavish tour of Christmas decorations and celebrations, at the former duPont estate. The 2011 Mummers Parade Results - here’s a complete list of winners and results, for all the various brigades and divisions - string bands, etc. The Philadelphia Auto Show 2011 - January 29 through February 6 at the Convention Center – is the city’s top showcase for automobile enthusiasts. Les Misérables Academy of Music review of its 25th Anniversary Production, on its U.S. Tour, playing January 4-15, 2011, at the historic arts venue. The 2011 Philadelphia Home Show, on its 30th Anniversary, pays tribute to Philadelphia sports history, as well as city-landmark inspired rooms. Save Tastykake! This uniquely Philadelphian snack food faces an economic threat, jeopardizing the traditional Krimpets, Kandy Kakes, Juniors, etc. For Valentine’s Day 2011 Philadelphia Hotels offer special packages and deals for couples to spend the February 11-14 romantic weekend in Center City. Philadelphia Valentine’s Day Date Ideas range from romantic rendezvous in superb Center City restaurants, to walks in quaint countryside villages. St. Patrick’s Day 2011 Events Philadelphia – the annual parade, which dates back to 1771, is the highlight – it will be on Sunday, March 13, 2011. Wing Bowl 19 is the annual, pre-Super Bowl eating contest at the Wells Fargo Center, to see who can consume the most chicken wings at one sitting. Presidents’ Day 2011 Philadelphia Events honor Washington and Lincoln each February – visit historic sites and museums, celebrating their legacy. The 2011 Philadelphia Flower Show has a French theme: “Springtime in Paris”. The yearly March event draws 250,000 spectators to the Convention Center. Chinese New Year 2011 Events Philadelphia, welcoming the Year of the Rabbit are in Chinatown and the Penn Museum’s Secrets of the Silk Road exhibit. Valentine’s Day 2011 Philadelphia Parties - opportunities for romance for couples, and to meet someone new, for singles – meet your match this year. The Philadelphia Flower Show - The Largest, Indoors, Worldwide. Read our Mary Poppins Academy of Music review, based on a performance on Philadelphia’s Avenue of the Arts, during the musical’s 2011 national tour. The Franklin Institute hosts Leonardo da Vinci's Workshop through May 29. See the genius of the Italian Renaissance artist, inventor, and visionary. Memorial Day 2011 Philadelphia Events Honor America's Veterans, where America's liberty and freedom were born, at many patriotic sites and museums. The National Constitution Center Spies, Traitors, and Saboteurs Exhibit focuses on the history of espionage activity in America. Read our review. Philly Beer Week June 2011 takes place for 10 days, with many events featuring the region's various craft beers and microbreweries. Here's our guide. Fourth of July 2011 Philadelphia events include the Independence Day Parade, the Party on the Parkway, and fireworks behind the Art Museum. Bastille Day 2011 Philadelphia Events include the Festival in Fairmount, with Eastern State Penitentiary's re-enactment of the historic French event. Philadelphia Union Soccer, a franchise of Major League Soccer, plays most home matches at PPL Park in nearby Chester, just off I-476/the Blue Route. The 2nd Street Festival 2011 Philadelphia is a six-block party in Northern Liberties, a gentrifying neighborhood, with vendors and free entertainment. Musikfest 2011 in Bethlehem, just 80 minutes or so north of Philadelphia, features over 300 musical events and concerts in 10 days, from Aug. 5-14. Rittenhouse Square Block Party 2011 will transform it into A Parisian-style Giant Outdoor Café, with 18th St. closed to traffic, with live music. The 2nd Annual Shane Victorino Foundation All-Star Celebrity Fashion Show will take place at the prestigious Union League, featuring many Phillies. Terror Behind the Walls 2011 at Eastern State Pen- the most popular haunted house in America: VIP After Dark tours, schedule, tickets, dinner packages. Shakespeare’s Globe London Cinema Series Henry VIII Review – a stellar cast brings the Tudor court to life on movie screens worldwide – it’s just like being there. A Phillies/Cardinals 2011 NLDS history, from the perspective of a heartbroken Phillies fan who hoped for more October baseball and a World Series title. The 2011 Liberty Medal ceremony honored former Defense Secretary Robert Gates at the National Constitution Center, with a star-studded extravaganza. The Stars & Stripes Canteen at the National Constitution Center - a ‘40s-themed event, celebrating the Fighting for Democracy exhibit in Old City. Our Rock of Ages Review at the Merriam Theater – the five-time Tony-nominated Broadway musical, an entertaining, energetic trip back to the 1980s. The Big Bang Musical Review at the Kimmel Center, with Tony Braithwaite and Ben Dibble – a highly hilarious romp through world history. Read more. Voyage of the Living Dead 2011 a scary tour on the Battleship New Jersey – a new Halloween event, on the Camden riverfront. Read more, if you dare! Alexandra Robbins Interview and Lecture at the Prep – where the best-selling author of education books, discusses "The Pressure to Succeed" for teens. Cirque du Soleil Quidam Review at Temple - the Liacouras Center was filled with stunning stunts and incredible acrobatics - an amazing experience. December 2011 Philadelphia Events – at Macy’s, the beloved Light Show, and entering the life-sized version of A Christmas Carol at Dickens Village. Jersey Boys Review Forrest Theatre – Frankie Valli and The Four Seasons return to their zenith at this outstanding musical, featuring their hits. 1812 Productions This Is the Week That Is Review 2011 - a hilarious send-up of all things political – the best topical humor in Greater Philadelphia. Ludwig Live! is lots of laughs at the Kimmel Center – and our review of Beethoven’s lounge show has a short bio that will help you enjoy the jokes! Memphis Review Academy of Music – the critically acclaimed, Tony-award winning musical brings 1950s rock ‘n roll to Philadelphia’s oldest venue. Rain Beatles Review at the Academy of Music – a very faithful version of the Fab Four’s Magical Mystery Tour arrives at Philadelphia’s oldest venue. Branch Review at the Society Hill Playhouse – the world premiere of the one-man play, featuring Branch Rickey, baseball’s most visionary executive. Valentines Day 2012 Philadelphia Events include romantic ideas for dates, Center City parties to meet other singles, chances for love, and much more. Altan Review Sellersville Theater – This authentic Irish band from Donegal brought a rousing mix of boisterous and wistful harmonies to Bucks County. 2012 Philadelphia Flower Show - Islands Of Aloha bring Hawaii home, as a trip to the newly expanded Convention Center takes you to a tropical paradise. Celtic Crossroads Review Sellersville Theater – This Irish supergroup, one of the finest brought an eclectic, rollicking show to Bucks County. Anything Goes Review at the Prep - a stellar shipboard comedy, a magnificent, professional-quality show at the elite North Philadelphia high school. Don’t miss stunning views of nature at Van Gogh Up Close, at the Philadelphia Museum of Art – it closes May 6, 2012. Read our review of the master. My Fair Lady review Act II Ambler – Tony Braithwaite and Eileen Cella expertly bring the classic musical to life in an intimate setting - read more. Riverdance review Merriam Theater – make sure you catch the worldwide, iconic megahit show of Irish dancing and culture on its final U.S. tour, ever! Barnes Foundation Philadelphia Opening Press Preview – the magnificent art collection’s new Parkway home features stunning architecture and landscaping. Taking SEPTA to Terror Behind the Walls at Eastern State Penitentiary, is difficult, because of reduced service at night. If you’re going to take SEPTA up, take a taxicab back to the train station. 4 Lads From Liverpool Review – Get Back to Act II Playhouse in Ambler to see it - the Fab Four in an intimate, cabaret setting, and experience the Beatles. Philadelphia Union received no fewer than three goals from forwards Freddy Adu and Josue Martinez, in downing the Dynamo, 3-1, at PPL Park. Putnam Spelling Bee At the Prep Review - You'll Be Spellbound by the performance of the best secondary theatrical program in the region. Read more. This Is The Week That Is: The Election Special: A hilarious skewering of the political scene, featuring Barack Obama and Mitt Romney, as befitting 1812 Productions. 2012 Army Navy Game Recap – The Navy Midshipmen defeated the Army Black Knights, 17-13, to capture the Commander-in-Chief’s trophy for the first time since 2009. Oh, What Fun! is a hilarious, all-original Christmas comedy variety show, starring Tony Braithwaite, along with Howie Brown, Will Dennis, and pianist Sonny Leo, at Act II Playhouse in Ambler. Irish Christmas in America Review Sellersville Theater – This group of Celtic performers brought an authentic Celtic Christmas variety show of singing, dancing, music, and comedy, to Bucks County. The spectacle and songs of Les Misérables wow audiences on its 25th Anniversary tour, at the historic Academy of Music in Philadelphia, to kick off the New Year. Read our review. The Franklin Institute hosts Titanic: The Artifact Exhibition through April 7. Experience the feeling of boarding the doomed Titanic, the world’s most famous ship, in 1912. It’s “Last Call” for The Roaring ‘20s, which come alive at the National Constitution Center’s American Spirits: The Rise and Fall of Prohibition. See amazing artifacts from this extraordinary era. Regardless of whether you’ve seen the movie, make sure you read our Rock of Ages review at the Merriam Theater – the show totally rocks! A comprehensive guide to the Sail Philadelphia Tall Ships Festival 2018 at Penn's Landing and the Independence Seaport Museum on Memorial Day Weekend 2018. Advice on Ship Tours, Ship Cruises, ticketing, fireworks, entertainment, and the best tips and ways to visit it. Act II Playhouse Camelot Review – The show magically conjures up the Arthurian legend, with its potent medieval mixture of music, romance, heraldry, royalty, idealism, and heartbreak – the epic tale spellbinds the audience - for one brief shining moment! Do not miss it!